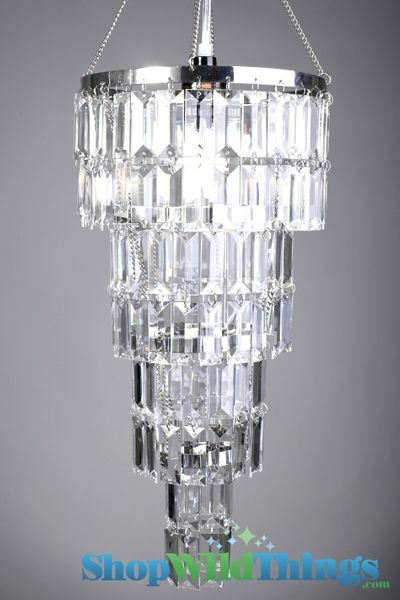 Home > Lighting > Chandeliers > Chandelier "Serena" w/ Clear Rectangle Crystals - 8" x 16"
Chandelier "Serena" w/ Clear Rectangle Crystals - 8" x 16"
Our beautiful Serena Chandelier has 4 tiers of fabulous VERY VERY VERY high-quality crystal clear acrylic beads in a faceted rectangle shape. This is a chandelier decoration and does not include a light kit. So many of our customers just want to hang these anywhere and do not want the electrical cords. If you want to use an electrical cord kit with a light bulb, we sell the cord here - Light Cord Kit. The center of the chandelier already has the hardware needed to hold the light kit in place OR you can use of our our LED light saucers in the top for cordless lighting. Where did you get that chandelier,I love it! I am very pleases with this small chandelier.I have in my hallway hanging over a mirror. It fit's perfect in the space.Lovely and cute on it's own.I added a light ring and it is a bling eye catcher when you walk in! ProsWas just what I was looking for in a small space.Adds just the right amount of bling ! ConsThe light ring does not sit flat on top of this chandelier .It sits a little crooked because the area is not quite wide enough to set it in. I changed out the warm lights for the cool. they seemed brighter and highlighted the item so much better! No worries about the light. It still looks good and will not fall off easily!